Sectarianism is one of the most problematic and divisive issues currently facing Scotland today. The idea of Protestant against Catholic is as much a part of our nationalistic story as any of the other clichéd stereotypes you care to name. It is an unwanted narrative that has managed to attach itself to Scottish culture; and one that is very hard to scrub Sectarianism is the barrier of bigotry and hatred that divides various religious groups throughout the world. In the Middle East, sectarian violence divides Islam in the form of Sunni against Shia. Recently in Myanmar it has taken the form of Buddhists clashing with Muslims. In Scotland it comes in the form of Protestant and Catholic. 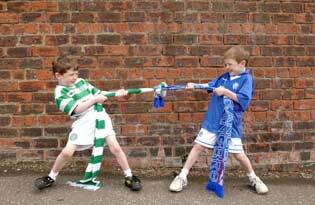 More simplistically though, Scotland’s divide can be broken down even further and explained in a more accurate way as ‘Rangers vs Celtic’. Sectarianism appears to have moved on from a religious issue and into a sporting one in Scotland. Whatever it has become in recent times though, it’s patently clear that it has to be studied addressed. Currently, it is a topic that’s rarely far from the headlines and through the use of mobile technologies and the internet, videos of sectarian songs and chanting at football stadiums or in public places are readily available for all to see. The advent of the internet has taken the issue out of the football stadiums and into the mainstream spotlight. It’s such a cultural behemoth in Scotland that it has even been brought to the theatre in recent weeks. Playwright Martin O’Connor, who was himself inspired by secondary school pupils in Glasgow, has used the topic for his latest stage show. The production was part of Glasgow’s Tron Theatre’s week long “football colours allowed” programme as a response to the issue of sectarianism. The past few months has also seen a rise in anti-sectarianism projects, such as this one by North Ayrshire Table Tennis Club, aimed at tackling the problem and helping to kick it out of society. Many of these initiatives are trying to tackle the problem by addressing it at youth level. These are great instances of the positive work being done to help solve the problem in Scotland. However, it’s not all positive news. In recent months there has been an investigation into the alleged chanting of sectarian songs by football fans; an incident in which two men were arrested and charged under the Offensive Behaviour at ‘Football and Threatening Communications act’. There has also been a rise in the number of arrests for sectarian related offences. In February, there were 37 arrests made during the Old Firm match, 12 of which were for sectarian related offences. It’s an issue that still troubles our society and one which, thankfully, is being addressed through some excellent projects at both national and local levels. It is apparent though, when looking at recent incidents, that there is still a long way to go before it can be claimed that there has been any real success in the fight against sectarianism in Scotland. A pro-active approach is needed in order to help educate people about the issue in order to prevent the next generation growing up harbouring the same mindless hate and bigotry that is causing so many problems today. This entry was posted in Sectarianism on 19th March 2015 by Chris Main.